The Third Order of the Slaves of the Immaculate Heart of Mary is a union of Catholic faithful who strive to have a share in the mission and charism of the religious congregation. Every Third Order is an organization within which laity (as well as clerics and religious who are not First or Second Order members of the order in question) can live their Faith more deeply and unite their prayers and works to those of the order to which they are attached. Thus, Third Order Carmelites, Franciscans, Dominicans, Mercederians, etc., and Benedictine Oblates participate in the particular work and spirituality of those orders. Most often, indulgences and other privileges from the Church are enjoyed by members of these associations, although, given our present lack of canonical status, there are no such indulgences or ecclesiastical privileges officially attached to membership in our Third Order. The Third Order of the Slaves of the Immaculate Heart of Mary is designed to let the member participate — by prayer and pious practices — in the spirituality of our congregation. They also participate in the intellectual life of our congregation by continued study (via the Saint Augustine Institute). Participation in this third aspect of our religious life, the missionary apostolate, may be exercised in a variety of ways, all of which are aimed at the conversion of one’s neighbor. Acknowledge the right of the Superior of the Order to terminate memberships whenever, in his opinion, sound and grave reasons exist. The method for practicing true devotion to Mary (item two above) is explained in the book True Devotion to Mary by Saint Louis De Montfort, available from our book store. The book describes the thirty-three days of preparation for making the total consecration to Jesus Christ through slavery to His Holy Mother, Mary. Also necessary for the preparation are a Catholic Bible — Douay-Rheims version — and the book, The Imitation of Christ. At the end of the thirty-three days, one will be prepared to make the decision whether to consecrate his life to Christ in this manner. If, at the end of the thirty-three days, the candidate decides to become a Slave of the Immaculate Heart of Mary, the Consecration Form should be read, signed and dated. It should also be witnessed (signed and dated) by a priest, but if that is not possible, any practicing Catholic can witness the consecration and sign the consecration form. Third Order members renew their consecration every year at a ceremony on Pentecost Sunday. After making the consecration, to join the Crusade as a Third Order member, the Application for Membership form must be completed and sent in along with the signed Act of Consecration form to the Center in Richmond, New Hampshire (the address is in the front of this booklet). A religious name, usually the name of a favorite saint, may be entered on the form. When the signed and witnessed consecration form and the signed membership application form are received, the information is reviewed. 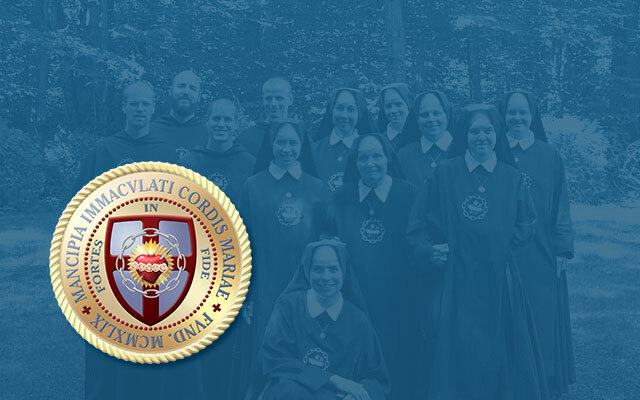 When approved, the applicant becomes a Tertiary member of The Slaves of the Immaculate Heart of Mary and receives a Consecration Certificate and a Certificate of Membership. The Application for Membership, Consecration Form, and detailed instructions for the thirty-three days of preparation (including a daily reading guide), are all included in the Third Order Information Packet. To request this packet, one may either write or call the Center, or email “General Information” (Brother Michael Marie, M.I.C.M., Tert. *) for it. Membership in the Crusade does not imply a financial commitment. Our greatest concern by far, and our greatest desire is that we be able to inspire every Catholic we can possibly reach to join us in this epic Crusade. There are no dues or other financial obligations, although we do have a voluntary monthly contribution program for anyone who is interested, and we would greatly appreciate a one-time donation of at least five dollars to cover printing and mailing costs associated with recruiting each new member. During their basic training, soldiers learn about their weapons and practice using them. Our weapon is the truth. We must learn about it in order to use it. To learn it we must study. Study informs the intellect and strengthens the will for our interior life and our apostolic life. Nemo dat quod non habet, “No man can give what he does not have”; therefore, study of the Faith is essential for spreading the Faith. The Saint Augustine Institute of Catholic Studies is the educational program of the Crusade of Saint Benedict Center. Its purpose is to provide a well-rounded and conveniently structured course of instruction in the Catholic Faith. The course of instruction is essentially the same as that offered at Saint Benedict Center since 1942. Our teachers are the Popes, the Councils, the Saints, and the Fathers and Doctors of the Church, who teach us the true interpretation of Holy Scripture and Catholic Tradition. The course has the aspect of continued adult education. Where practicable, small groups of Catholic men and women, each comprising no more than twelve members, form a Circle of Study which meets weekly to study and learn the Faith. The topics of study are specified in the Syllabus of the Saint Augustine Institute, available from our bookstore. Circles of Study are the dynamic training grounds of the whole Crusade. Details on the Saint Augustine Institute and Circles of Study are given in our Third Order Manual. Doing any of the spiritual or corporal works of mercy, employing every means possible to convert souls. The primary objective of any religious congregation is to help each member seek union with God and the salvation of his soul. This applies to the Third Order as well as to the First and Second. This means that the sanctification of each member is of paramount importance to our work. To ignore the interior life is to neglect the very fundamental reason for any religious consecration. As we have said, the devotional life is not separate from our life of study, and neither is it isolated from our apostolate. They all emanate from the same impulse to love God and be true servants and slaves of Jesus through Mary. Brown Scapular of Mount Carmel — wear it with constancy and devotion. Miraculous Medal — wear it with constancy and devotion. The Holy Rosary — pray daily at least five decades, one chaplet, as Our Lady requested at Fatima. It should be noted that these obligations are not binding under pain of sin. In addition, tertiaries take no vows, only a promise of obedience in matters pertaining to our Crusade. Other recommended but optional devotions and novenas are covered in our Third Order Manual. The following current officers of the Third Order, M.I.C.M., may be contacted directly. All are tertiaries except Brother Francis who is Superior and Brother André who is Prior of the Slaves of the Immaculate Heart of Mary. Saint Augustine Institute Coordinator: Brother Francis, M.I.C.M. *Tertiaries use their religious names only when communicating with the Center or engaging in a work under the direct authority and approval of the Superior. The Third Order member puts “M.I.C.M., Tert.” after his name. “M.I.C.M.” without the “Tert.” is reserved for the use of First and Second Order members only.